(Aug. 25, 2016) -- The first Speed Safety Cameras in Oregon are now operational on SW Beaverton-Hillsdale Highway, and will begin issuing warnings today to drivers who exceed the road’s posted 40 mph speed limit. The goal of the Speed Safety Cameras is to reduce speeding and save lives. The SW Beaverton-Hillsdale Highway corridor is part of Portland’s High Crash Network of roads. 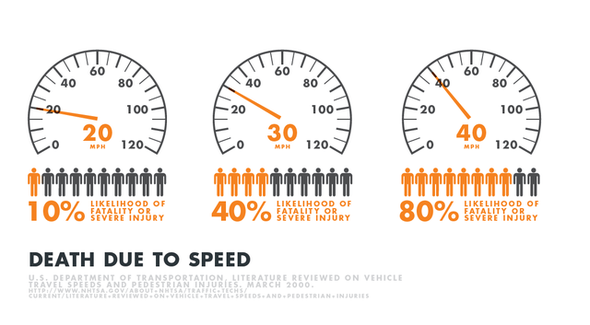 PBOT’s recent Vision Zero crash data analysis found that Beaverton-Hillsdale Highway is one of the top roads where people driving are killed or seriously injured. People walking along or crossing on foot are twice as likely to be struck by a car than on the average city street. Photo by Hannah Schafer, Portland Bureau of Transportation. 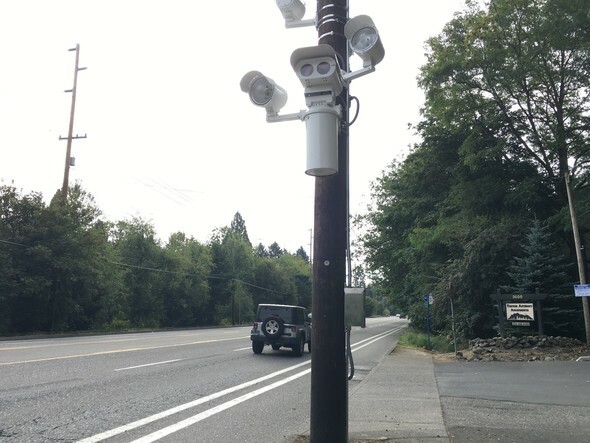 The installation on SW Beaverton-Hillsdale Highway is the first safety camera installation since the City of Portland and community safety advocates convinced the state Legislature in 2015 to pass HB 2621, which allows them to be used on High Crash Corridors in the Portland city limits. The City of Portland has been using other cameras to supplement speed enforcement for years, with police officers in vans enforcing speed limit violations. Portland also uses cameras to increase enforcement compliance with red lights at traffic signals. Safety Cameras are a proven safety tool that can reduce dangerous speeding and save lives. The cameras are mounted along High Crash Corridors and when people driving past them exceed the posted speed limit, they capture photos and video for review by Portland Police. The Speed Safety Cameras will issue warnings for the first 30 days of operation, and issue citations starting Sept. 24. An officer from the Portland Police Bureau will review violations before a citation is issued. The typical fine will be $160. Any money received from the tickets pays for the program and safety improvements on the corridor. Additional cameras will be installed during winter and spring 2017 at SE 122nd Avenue between Foster and Powell Boulevards, Marine Drive and Outer SE Division Street. In addition to the new cameras, PBOT is delivering three additional safety and maintenance projects on a section of SW Beaverton-Hillsdale Highway beginning this fall that reflect the goals of the Southwest Community Plan and the Beaverton-Hillsdale Highway High Crash Corridor Safety Plan. Paving maintenance: PBOT will perform a two-inch grind and pave maintenance project, resulting in new pavement from SW 21st/Bertha Court to SW 35th Avenue to be delivered this fall 2016. Safety Demonstration Project: PBOT will deliver a Safety Demonstration Project on Beaverton Hillsdale Highway in spring 2017. The project includes a new marked pedestrian crossing with a median island with Rapid Flashing Beacons at 35th Avenue, a protected pedestrian/bike lane space, reduced travel lane widths, and new ADA-compliant pedestrian curb ramps. Stormwater Improvements: PBOT and the Bureau of Environmental Services (BES) are partnering to install stormwater curb extensions on at Shattuck. These will shorten the pedestrian crossings and ADA curb ramps will be constructed at all corners. Construction will be completed in the 2016/2017 fiscal year. Photo by Gabe Graff, Portland Bureau of Transportation. 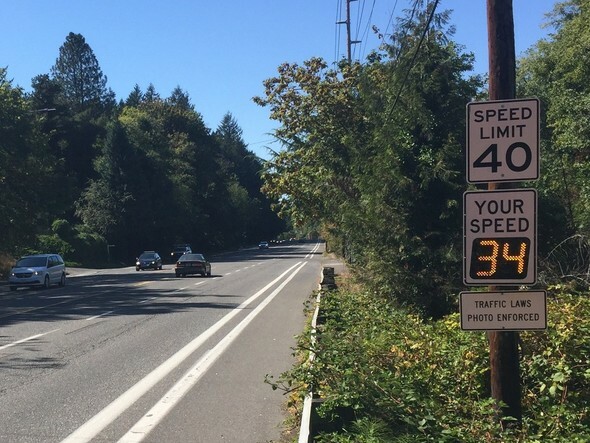 New speed signage and speed reader boards were also installed on SW Beaverton-Hillsdale Highway warning drivers in advance of the cameras in both directions. Additionally, PBOT staff conducted extensive outreach with local neighborhood associations as well as over 75 businesses and community organizations to raise awareness of the changes along the corridor.